Interesting short article in Nature referring to a project to evaluate the competence of private weather forecasters (may require a subscription?). Frustrated weather forecasters are fighting back against rogue companies that sell forecasts with claims of impressive accuracy, but that have no apparent scientific basis. Meteorologists are concerned that the rise of private forecasters could affect the reputation of their trade. They are reluctant to name specific firms for fear of legal action, but say that some forecast providers use professional-looking websites to hide the fact they are using scientifically flawed methods that produce unreliable predictions. "We have companies claiming they can predict months ahead, using methods they will not mention," says Pascal Mailier, a meteorologist at the University of Reading, UK. They couldn't mean Piers Corbyn, could they??? This is why I was wedged on a train on Friday morning - to visit our close partners CCSR for a project workshop on climate research (our usual commute is a cycle ride to our own lab, which is a much more pleasant journey). The main reason for attending is that due to the number of foreign visitors, it is all in English today :-) We arrived in good time for coffee and a tour of the impressive building. There are various presentations about model developments and how they improve (or not) the model behaviour, also detection/attribution/forecasting of climate change. All fairly typical fare in the climate modelling world, and several bits were very interesting - particularly looking at the global cooling after the Pinatubo eruption and how this can be used to estimate sensitivity to GHG forcing, which I'm hoping to delve into in more detail shortly. The Hadley Centre/CGAM visitors also reported on their progress and plans - mostly computing details so far, with science to follow. And then the ice-breaker party and an upgrade to first class (Green Car) for the trip home so we don't have to stand all the way. It's time I wrote something about this fabulous geek toy. But let me start off by telling the world what an outrageous hypocrite my wife is. Um...where was I. Oh yes, I am standing on a packed morning train to Tokyo, barely able to breathe, typing this email on my computer. Can't be that squashed if there's room to use a laptop, right? Wrong. This computer is PDA-sized. Well, that's not so exciting either - PDAs are old news. The Zaurus is indeed a PDA, but an extemely versatile and powerful one. It has a clamshell design, with full keyboard (like a mini laptop). The (touch-sensitive, extremely bright and clear) screen also swivels round and folds flat, turning it into a "palm" form-factor PDA. But most importantly, it runs linux with the OS stored on flash memory, so it is fully customisable, there is a lot of free software and an active group of users and developers working with it. There are on-board java and C compilers available for it - I used it to learn a little java and wrote a simple kanji flashcard application for my own use. Mine gets used mostly for email/web (PHS card for mobile internet access, and wifi when available), mp3 player, Japanese learning/dictionary, writing LaTeX papers and presentations (and reading pdf files) while travelling. It can even drive a projector directly, but generally I make a pdf file and transfer it to a more powerful PC. I took it to the EGU in Vienna recently, where everyone else was lugging around a laptop or queueing up for public terminals. Its 8h battery life gives a proper day's use or more without having to search out power sockets. It is fully bilingual in Japanese and English, with lots of learning tools (people who have no interest in Japanese can easily convert it to pure English, and if you buy it off an importer like Dynamism or Conics they will do that for you, and look after the return-to-Japan warranty). Back to my wife and her hypocrisy. Well, I got the then top-of-the-range SL-C860 last year. She kept telling me how crap it was, how it always needed rebooting and never did anything useful. I must be fair and point out that she does most of the linux sysadminning (we have a stable of Macs with OSX too, both at work and at home) so did usually see it at its worst. But still, it was't that bad. Last week she got the new SL-C3000 (with 4GB internal hard disk). She hasn't put it down since, and is complaining that an 8h battery life doesn't give her a full day's use! Piers Corbyn runs Weatheraction, an independent and rather controversial weather forecasting operation which claims to be able to make useful long-term predictions. It's controversial because most weather forecasters do not believe there is any merit in his principles (he claims that the forecasts are based on solar output) or his forecasts. Moreover, he refuses to detail his techniques or even test his skill in any objective manner. This article puts his case, and that of his critics, in a reasonably fair way. It seems likely that much of his "success", such as it is, is based on issuing forecasts that read like horoscopes, where an optimistic assessor would find merit, but a critical assessor would find fault. Anyway, I'm not really writing about his weather predictions, but his climate forecast. 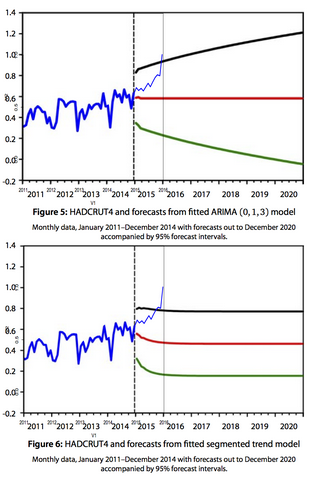 Of course this forecast strongly contradicts all the projections of the IPCC. If correct, it would have almost unlimited commercial value, as it implies (among other things) that all concern over anthropogenic global warming is misplaced. I think it's fair to say that the vast majority of scientists with any knowledge of climate science would say that the forecast is nonsense. However, what matters to me is what Corbyn himself thinks. So, I emailed him to ask him if he could quantify his "considerable world cooling", and whether he would consider a bet with me on the subject. Note that unlike the other people I have previously tried to arrange bets with (here and here), he actually makes his living out of selling forecasts, and is proud to boast of taking on the bookies and winning. So he won't have the "I don't take risks" excuse of Myron Ebell. I've not managed to get any reply out of him at all, still less a bet. For someone who claims a success rate of 80% or more with his forecasts, he seems remarkably reluctant to make any money out of this one. Could it be ... that he knows it is wrong? So I'm still looking for that elusive consensus-busting sceptic who is prepared to make a forecast, and stand behind it. If anyone hears of a sceptical prediction, please let me know. World Climate Report (apparently another fossil-fuel-funded lobby group) is a blog run by Cato Institute member Pat Michaels and a couple of others. Unfortunately, I only found out about this recently. Nevertheless, I asked them what their current position was. Chip Knappenburger replied. He admitted that at present, they stood to lose the bet (there is a minscule negative trend from Jan 1998 to April 2005, but certainly not a significant one - note that significant was their qualifier, not mine). He tried to sound bullish about how he expected the MSU temperature to drop in the future....but was not prepared to bet either on the terms of the original wager, or propose a new bet starting from the present. "No reasonable offers refused" indeed. Have they learnt their lesson? Time will tell. Here I've plotted the MSU data from Jan 1996 to the present (April 2005 at time of writing), together with the overall trend in black starting in Jan 1998 (-0.007 degrees per year) and how this trend has evolved over time (the red lines show trend after 1, 2, 3, 4, 5, 6, 7 full years from Jan 1998). I guess they might have been feeling confident for the first year or two. I included the two previous years to indicate to what exent they cherry-picked their starting point - the first data point is the one at +0.5. Of course it doesn' t matter what bet they offer if they won't honour it! George Monbiot is getting in on the game now. Ok, I admit, emailed him about it - but was surprised and pleased that he picked it up so enthusiastically. Within a day of my emailing him about my dealings with Richard Lindzen, he was on the BBC Radio4 "Today" program (morning news and current affairs) debating climate change with Myron Ebell (typical right-wing think-tank person). Monbiot's opening gambit was to challenge Ebell to a bet over whether the world was going to warm up over the next 10 years. Ebell declined the bet, and admitted that indeed it was likely to warm up. You can find the interview here. The tactic seemed to work well in terms of putting Ebell on the defensive. Of course my original hope was that the bets would establish what the range of beliefs actually was, but so far not a single sceptic has come forward to disagree with the standard (IPCC) view. Sooner or later the denialists might decide that it is worth taking on a few losing bets, just to avoid looking dishonest. I just hope I can get a slice of the cash when they do. It's not just on STW, either, as this thread on MTBR shows. But since none of the riders seem unduly bothered by this, it looks like no-one is going to get around to fixing the problem. Seems to me like it's a obvious lawsuit waiting to happen, but that's not my problem. A fun look at what ID cards could bring. I'm not sure if our local pizza delivery has caller ID or just recognises my halting Japlish, but they seem to work out who I am pretty quickly. I'm just relieved that the pizza usually comes to the right place at the right time now! Mid-May sees the early season "Beach Festa" (Japanese link) with hula dancing and ukelele playing all round. Of course, no Japanese festival is complete without food stalls. Here is the usual array, with toffee apples on the far right, Hiroshimayaki (okonomiyaki) in the middle...but what is that one with the blue awning and children crouching round? The writing literally translates as "Goldfish scooping"!?! And sure enough, it really is a catch-your own dinner stall!